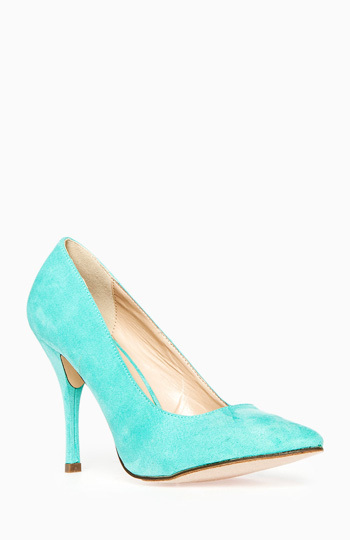 Faux suede heels with a pointed toe. These shoes are great - the color is just as it appears in the picture. The only thing I was uncertain about was the heel height. I think I'm generally used to wearing 2.5 in high heels (aka comfy heels) and these are definitely a strong 4 in. heel! If you're up for wearing high shoes, these would be a good fit. I ordered a 10 and usually wear a 9.5 - I think these run close to size, since the 10 is only a little bit big.